Hemps, also known as cannabis sativa, are natural plants that are of the same species as Marijuana. They originated from central Asia and slowly started to spread to other countries like the eastern parts of Asia, India, and Europe. Due to the difference in cultures between these countries, Hemps have evolved into various kinds of species. The Thai species focuses on developing the fiber of Hemps to be strong and of the highest quality. It also has tetrahydrocannabinol, THC, which has little effect on your nervous system. When Hemps were first found in the 1100s in India, they were originally used to cure diseases. Sometime after this, however, Europe and America used Hemps to make Marijuana. Marijuana is an addictive drug that tricks and deceives the mind, so governments had to pass laws that strictly controlled the planting of Hemps. It has also been discovered that the fiber from Hemps were used to make the cloth that was used to wrap mummies. The fiber from Hemps were very strong, it was great for protecting against bacteria, fungus, and dust mites. It could also maintain the temperature of things wrapped inside, all these attributes assured that the mummy who be preserved in a perfect condition. The Mhong people in Thailand have been associated and used Hemps for a very long time. It is a plant that is connected to their culture and tradition. Almost every aspect of their daily lives involves Hemps. The clothing, hammock, and blankets are only some of the things used by Mhong people that are made from Hemp fiber. Besides this, Mhong people also use Hemps to do business. When Mhong people are old they make special clothes from Hemp fiber, which they will wear when the pass away because they believe that this will send them to heaven. As you can see, Hemps have been a very important part of Mhong people’s lives and they still are today. Nowadays, the species of Hemps and Marijuana have been clearly divided in different groups. 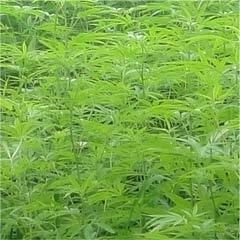 Marijuana are planted for the use of their leaves. Hemps, on the other hand, are planted for the use of their fiber. Hemp fiber is considered to be sticky, strong, and can be used for a long time. Today, Hemp fiber are used to make many different products like paper, textile, rope, and clothing. Research shows that Hemp fiber produced in the Northern parts of Thailand are the best in the world. 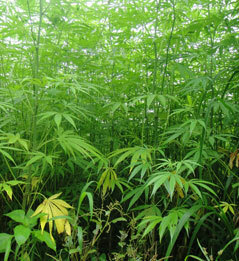 Hemp fiber has been an essential part of the Mhong people’s way of life for a very long time. 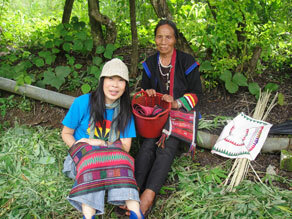 They both use Hemp fiber for their daily life and for traditional activities and beliefs. In the past, when there wasn’t any other type of fiber available for purchase, Mhong people would take sheets of Hemp fiber and cut and sew them into clothing or other things that they used in their daily lives. Nonetheless, an apparently obvious attribute of the Mhong people was to use Hemp fiber to make skirts, which has been passed down to today’s generation. 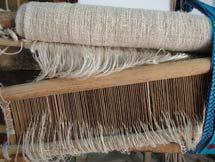 Mhong people prefer to use white Hemp fiber to make skirts. 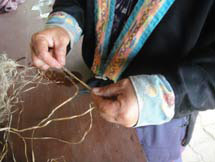 After the skirts are sewed, they will use beeswax to decorate the skirts. Then, they will have the skirts dyed with Hom or Glar, so that they will turn out to be indigo. Finally, they will use honey to embroider designs and patterns on the skirts. As for their tradition and beliefs, Hemp fiber is considered to have a profound meaning and is used in many traditional festivals by Mhong people. 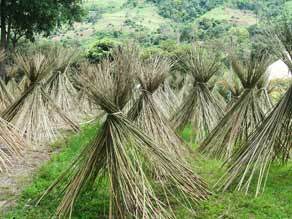 An example of a traditional festival a festival that involves communicating with spirits, in this festival they will have to make a bridge from Hemp fiber. This bridge connects between the top of doors, so that soldiers from the sky can come down to help during this festival. This festival is held every New Year. One of their most important festivals that involves Hemp fiber is a funeral. In the first part of the funeral, they have to pray and guide the dead person’s soul to their ancestors. They will also have to make shoes from Hemp fiber for the dead person to wear because they believe that these shoes will be able to guide that person through lands that are full of caterpillars and forests with thorns, so that they can eventually be reunited with their ancestors. Furthermore, the soul of the dead person will also encounter ferocious creatures, like tigers and serpents that are going to try to eat them. In order them to avoid being eaten they will need to throw Hemp fabric into these creature’s mouths. Nowadays, there are many restrictions in planting of Hemps because some people use them to make Marijuana instead. 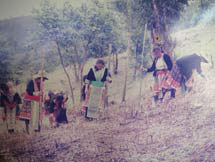 Mhong people are not allowed to plant Hemps freely, like in the past. This has lead to a lost in careers, tradition and a sense of belief among Mhong people. We, DD Nature Craft, have helped and encouraged this career of Mhong people to continue. This way a tradition that has existed for centuries and high quality fiber and products can continue to live on forever. Pollution free:Hemp is such as hardly plant that can grow almost anywhere at any climate; it hardly needs fertilizer, herbicides or pesticides, so it reduces the pollution to the earth, air and water; but this is not all. Hemp itself actually cleans up toxins from the ground, under a process namely phytomerediation. Chemical pollution can also be significantly reduced if displace cotton with hemp for clothing, as 50% of the world’s pesticides goes on cotton fields. Sustainable Agriculture: Not just can be grown without fertilizer, hemp plant also replenishes soil with nitrogen and nutrients, increases the topsoil, and restore the health and fertility of the soil that makes hemp farming becomes a sustainable agriculture. Erosion control: Hemp tree has long roots that firmly hold the soil which help control the erosion. Carbon Sequestration: Due to its fast growth, hemp may also be useful in carbon sequestration – absorbing carbon from the air and storing it back into the earth. Clean industry: Processing hemp fiber for paper and cloth does not require chlorine that produces dioxins as it does with wood or cotton fiber. Paper industry which today mostly uses wood pulp has now become the 3rd largest polluter. Switching to hemp fiber will make an immense improvement to our Earth. Eco Fuel: As biodiesel fuel, hemp fuels emit 80% less carbon dioxide with almost no sulfur dioxide compared to fossil fuel. This makes hemp flues do not destroy the ozone layer, generating less greenhouse gas nor causes acid rain that contribute to global warming and climate change. Hemp fuel even found to be 10 times less toxic than salt and as biodegradable as sugar! Water-saving: Hemp plant helps the water crisis that the Earth is facing now, because it does not need much water to grow. Compared with other wood and cotton plantation, hemp requires much less water. Land – saving: 1 acre of usable hemp fiber is equal to the usable fiber of 4 acres of trees or 2 acres of cotton. Using hemp could save the land cleared for agriculture means; hemp production could reduce the deforestation. Durable products:Hemp produces stronger fiber than most other plants, and can be recycled many more times than other products can. Therefore hemp products are supporting the ” reuse, reduce, recycle” of the eco living. Efficient Land Use. Hemp can yield four times of an average forest can. A hemp crop can be harvested in ninety days, while trees take around twenty- five years. Just imagine, once we harvested the forest, it will need some 25 years to recover the deforestation. Oxygen release. Hemp trees are proven to release lots of oxygen. 1 Peeling the shells of Hemps to make fiber You start off by squeezing the center of the trunk until it breaks and then you peel the shells or fiber. 2 Attaching the fiber Massage the Hemp fiber until it becomes soft. Then, string or attach them together by lacing them over each other so that they are not tangled together. 3 Squeezing the fiber Spin the fiber until it gets smaller and stickier. Then, you have to check and reattach the fiber that has been torn. 4 Boil until it turns white In order for the Hemp fiber to be sticky and firm, you must boil the Hemp fiber and then rinse it. You must do this until the fiber turns white. 5 Ironing the fiber The next step is to iron the fiber again, so that every string of fiber is firmly attached to each other. 6 Inspecting the fiber You must separate and inspect each string of fiber and make sure that it is good enough. If some of them are torn then you must reattach them again and place them in a basket. 7 Preparing the fiber to put them in the weaving machine To make sure that everything is in order, the Hemp fiber will be pulled tight and inspected on once again to make sure that none of them are torn. 8 Weaving the fabric Weaving fabric takes many days before you can get the Hemp fiber used for sewing clothing and other things.